It may seem odd to consider June 2016 as January approaches, but I try to think ahead. And June 2016 is a milestone anniversary of sorts. So, I will start with some history, and then an offer to get something special and make a charitable donation at the same time. 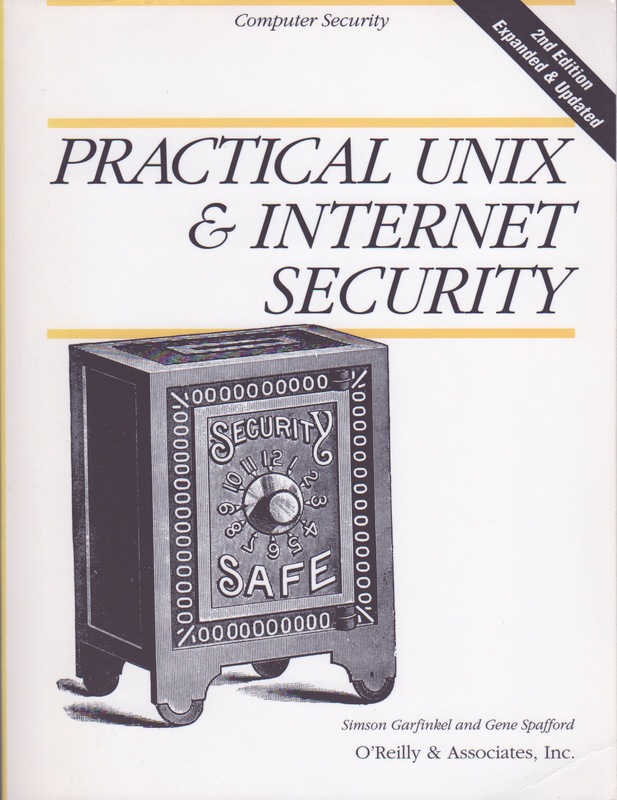 In June of 1991, the first edition of Practical Unix Security was published by O’Reilly. That means that June 2016 is the 25th anniversary of the publication of the book. How time flies! Read the history and think of participating in the special offer to help us celebrate the 25th anniversary of something significant! In summer of 1990, Dan Farmer wrote the COPS scanner under my supervision. That toolset embodied a fair amount of domain expertise in Unix that I had accumulated in prior years, augmented with items that Dan found in his research. It generated a fair amount of “buzz” because it exposed issues that many people didn’t know and/or understand about Unix security. With the growth of Unix deployment (BSD, AT&T, Sun Microsystems, Sequent, Pyramid, HP, DEC, et al) there were many sites adopting Unix for the first time, and therefore many people without the requisite sysadmin and security skills. I thus started getting a great deal of encouragement to write a book on the topic. I consulted with some peers and investigated the deals offered by various publishers, and settled on O’Reilly Books as my first contact. I was using their Nutshell handbooks and liked those books a great deal: I appreciated their approach to getting good information in the hands of readers at a reasonable price. Tim O’Reilly is now known for his progressive views on publishing and pricing, but was still a niche publisher back then. I contacted Tim, and he directed me to Debby Russell, one of their editors. Debby was in the midst of writing her own book, Computer Security Basics. I told her what I had in mind, and she indicated that only a few days prior she had received a proposal from a well-known tech author, Simson Garfinkel, on the same topic. After a little back-and-forth, Debby introduced us by phone, and we decided we would join forces to write the book. It was a happy coincidence because we each brought something to the effort that made the whole more than the sum of its parts. That first book was a little painful for me because it was written in FrameMaker to be more easily typeset by the publisher, and I had never used FrameMaker before, Additionally, Simson didn’t have the overhead of preparing and teaching classes, so he really pushed the schedule! I also had my first onset of repetitive stress injury to my hands — something that bothers me occasionally to this day, and has limited me over the years from writing as much as I’d like. I won’t blame the book as the cause, but it didn’t help! Anyhow…. the book appeared in the summer of 1991 and became a best seller (for its kind; last I heard, over 100,000 copies have been sold in 11 languages, and at least twice that many copies pirated). Thereafter, Simson and I also worked on a book on www security (editions in 1997 and 2002), along with our various other projects. 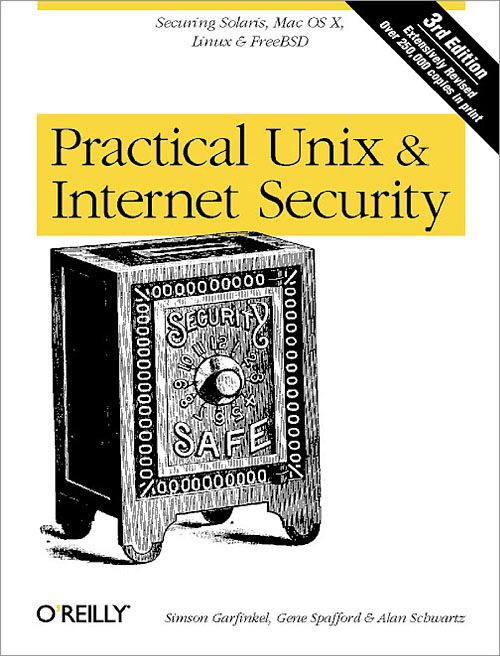 After several years, we produced a major rewrite and update of the Unix security book to include material on internetworking (a fast-growing topic area). That second edition was published in 1996. Simson and I had gotten so occupied with other things that we welcomed a 3rd author for the third edition of PUIS (as we came to call it): Alan Schwartz. That edition appeared in 2003 and included many updates, plus extension of the material to cover Linux. Simson went on to write many other books, started several companies, then went back to school to get his PhD. After a while as an academic, he is now a research scientist with NIST…and occasional tech essayist. Alan has a career as a consultant, author, and professor at the University of Illinois at Chicago. Me? I continued on up through the ranks as a POP (plain ol' professor) at Purdue University, including starting CERIAS. Given all the various changes, and how busy our lives have become with other things, there are no current plans for a 4th edition of the book. If we were to do one, it would probably need to be split into at least two volumes, given all the changes and issues involved. Possibly interesting bit of trivia: Simson and I did not know each other prior to late 1990, and we did not meet in person until 1992 — more than a year after the book was published! However, the experience of working together brought about an enduring friendship. I also did not meet Alan until several years after the 3rd edition went to press. If you have someone (maybe yourself) who you’d like to provide with a special gift, here’s an offer of one that includes a donation to two worthwhile non-profit organizations. (This is in the spirit of my recent bow tie auction for charity.) You can make a difference as well as get something special! Over the years, Simson, Alan, and I have often been asked to autograph copies of the book. We know there is some continuing interest in this (I as asked again, last week). Furthermore, the 25th anniversary seems like a milestone worth noting with something special. Therefore, we are making this offer. 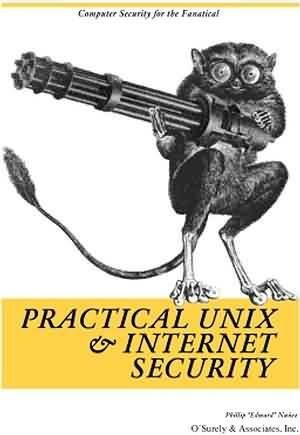 For a contribution where everything after expenses will go to two worthwhile, non-profit organizations, you will get (at least) an autographed copy of an edition of Practical Unix & Internet Security!! Depending on the amount you include, I may throw in some extras. The organizations we’ve chosen are EPIC and the ISSA Education Foundation. The Electronic Privacy Information Center (EPIC) is a non-partisan, non-profit public interest research center established in 1994 to focus public attention on emerging privacy and civil liberties issues and to protect privacy, freedom of expression, and democratic values in the information age. The ISSA Education Foundation is a non-profit organization associated with the international Information Systems Security Association (ISSA). It provides scholarships and educational programs on cyber security worldwide. This offer is thus contributing to two worthwhile organizations — one supporting better security, and one supporting better privacy. 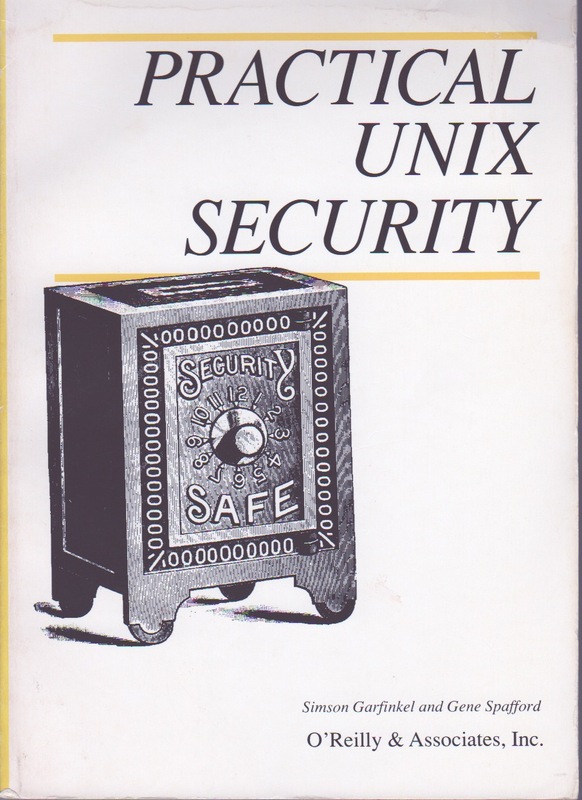 Send your copy of any edition of Pratical Unix Security and I (Spaf) will autograph it, then return it to you. Send your book along with a suggested inscription, and I (Spaf) will use that along with the autograph, subject to the caveats given below. I will send you a brand new copy of the 3rd edition with my signature. Simson and I will both sign your book, and if it is the 3rd edition of PUIS, so will Alan. (If it is a first or second edition of PUIS, Alan will sign it if you ask, although he didn't help author those editions.) If you suggest an inscription, one of us will add it, subject to the caveats given below. We will provide you with a new copy of the book, signed by all 3 authors, with a suitable inscription. Same as the previous category, plus we'll toss in one of Spaf's bow ties. (If that doesn't make sense, you haven't been to one of his conference talks or distinguished lectures in the last two decades.) This offer is limited to the first 8 at this level. All of the above plus something...make a suggestion. (No, we won't write your project code or hack into the Federal Reserve for you). We will send you five brand new copies of the latest edition of PUIS, signed by all 3 authors. As an additional offer, Simson and Spaf will sign and return your copy of Web Security, Privacy, & Commerce for an additional $25 if you include it with one of the above. We are making no profit on this offer! Anything above what is spent on shipping will get split evenly between the designated organizations. We are donating our time, gas (to drive to the post office), and ink to do this. We will share images of the receipts with anyone who asks for proof. Don’t have a copy of the book already? Copies are still for sale via O’Reilly, Amazon, Barnes & Noble, and other likely sources. It should be easy to get (at least) one. As noted above, we are willing to do even that for you if you will pledge a sufficient amount for this fundraising drive. This is an offer that will not be repeated...unless we happen to be around 25 years from now and decide to do this on the 50th anniversary! This offer will expire at noon on Feb 1, 2016, so participate soon! If you act quickly, this could make the perfect "white elephant gift" for your annual office gift exchange, or maybe an odd stocking stuffer for that certain someone but you must order right away! And if you keep it for a few years, you might be able to use it at an upcoming SCA event! You must provide a check or money order in US dollars with the book(s), made out to “Eugene H. Spafford.” Put “Holiday fundraising offer” in the memo/notes field. Any items sent with an invalid form of payment will not be returned. Alternatively, you can include checks or money orders made out directly to each of the two organizations and we will simply send them on. (The goal is to raise money for these worthwhile organizations and celebrate the anniversary of the book, not to handle a lot of funds!) That will allow you to take the tax deduction, if it is applicable to your circumstances. Be sure to include your return address! Even better, include a pre-made return address label acceptable to the USPS. All signed books will be returned via “book rate” US mail (USPS). If you want something faster, insured, or tracked, then send a pre-paid, self-addressed FedEx, or UPS envelope sufficient to hold the book in a padded envelope. You must do the same for shipment outside the United States! We will not be responsible for damage or lost items sent “book rate” in regular mail. If you send a contribution for a custom inscription but don’t suggest one, we will make one up. If you suggest an inscription that we find offensive (e.g., “COBOL Rules!”) or legally problematic (e.g, “I embezzled $100 million”) then we will make up something else. All contribution amounts beyond what is required for shipping expenses will be split evenly between the two organizations. No handling expenses will be charged (insert your own joke here). And no, we don’t have books with anything like this cover; We wish we did! !